Fast, convenient, easy, efficient – is what comes to mind when one thinks of the Mother of all Fast Food Restaurant chains – McDonalds! McDonalds serves 68 million people everyday in 119 countries. How then, did their Indian food ordering and delivery mobile apps got it so wrong? Why do restaurants need mobile apps? Simple, so customers develop a habit of pulling out their favourite phones and order in a couple of easy steps.Traditional ordering over the phone is fraught with activities that increase friction – the pain of searching for phone numbers, fumbling around with menus and figuring out what to order and explaining delivery addresses. The Fogg Behavior Model (https://www.behaviormodel.org/) shows that three elements must converge at the same moment for a behavior to occur: Motivation, Ability, and Trigger. When a behavior does not occur, at least one of those three elements is missing. Trigger – In our case study this is the obvious part, our trigger is external – HUNGER! Motivation – The motivators here are both satisfaction and anticipation. Ability – We will be focussing the most here. Digital product designers more often than not give users more credit than they deserve. Users of digital products DO NOT want to be trained on how to use a product – UX is akin to a joke, if it needs to be explained – you’re wasting everybody’s time. So how do designers increase the ability of users to use their product – the answer is simple – simplicity. Designers need to make their products drop dead simple making the user experience as seamless as possible reducing user input like clicks, typing, selecting, verifying. In this case study we will compare 2 apps that set out to do the same thing – create a user habit for their customers to order food. Let’s now review the user experience on the Billion dollar Restaurant chain app. So, you start off with entering your name, mobile no., email, password and confirm password and a CAPTCHA – yes a captcha, now that’s a first on a mobile app. Are phone bots really a thing? LOL. The app then tells you that an activation code has been sent to you via SMS and EMAIL. In my 5 attempts the SMS never made its way through – no worries, the email will have the activation code right? WRONG! The email has an activation URL you need to click and the web page that opens up says you are now activated. What do you do on the app then? If you were me you gave up the first 3 attempts and mustered the courage to give it another shot a few weeks later and use your imagination. Go back to the login page and enter your email and password combination to login. I guess they really want you to EARN that burger and fries! Ok great, I am getting hungry, time to order. The app asks me for my Delivery address – State, City, Area, House no. and floor. Wouldn’t that info be available with that location stuff that’s all the rage these days? hmmm. Time to hit that 3.25” disk save button on the top right of the app. Do millennials even know what that thing is? I feel like a veggie burger, so I click on Burgers and Wraps which takes me to a new screen where I choose McVeggie which takes me to a new screen where I choose McVeggie (Dejavu?) which takes me to another screen where I choose how many McVeggies (This is getting ridiculous). So, for a first time user the app makes the user traverse at least a 10 screens, manually enter at least 12 form fields to order a single item. So much for simplicity. As clichéd as it sounded, our client (a fast food chinese delivery chain) wanted “an Uber for chinese food”. But, that was a good thing – here was someone who knew what they wanted and gave us something to work with. An app that makes it so easy to order chinese, that your grandma could use it. The first screen that comes up is a map screen with your current location selected which in this case is my house, so I just click on it to select it as my delivery location. The next screen is where I can see the main categories in the menu. Lets tap on that “Meal in a bowl”. Next I am taken to a screen where I can see all the menu items and I can easily identify what I am looking for looking at the nice big food shots, a tap on the picture gives me a brief description of the dish. Ok, since I was in the mood for some noodles, I simply tap the on the rice noodles option on the menu. If you recall the Mcdonalds app had a separate screen for sub menu types like veg, chicken, fish etc and another screen to select the quantity. This is elegantly handled in the Happy Hakka app on a single screen for an entire category of menu items. Ok, I am ready to order now – I hit “Checkout” on the screen I am on and am shown my order summary and billed total. Since this is the first time I am using the app, it asks me to enter my mobile no. to send me a verification code. I enter my no. and am sent a verification code via sms that I fill into the next screen to verify myself. No scope for prank orders here and the store can easily call back to confirm orders, delivery times etc. That was it – NO SIGN UP, NO SIGN IN. Once your no. is verified, you will not be asked to sign in to the app, so no need to remember yet another password and no need to give another app access to your FB profile. So, a first time user is shown ONE and only one extra screen when using the app to place an order. 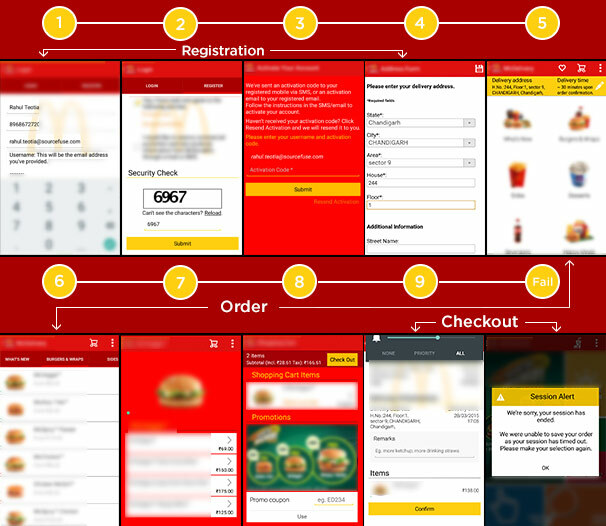 The order flow makes a user traverse through a minimum 4 screens (versus 10 in Mcdonalds) and 2 form fields (versus 12 in Mcdonals) to place an order. So, as per Fogg we have maximized the “ability” (by increasing simplicity of the app) of a user in the formation of a habit to occur. We have little or no control over the trigger but the third element of motivation could also be leveraged in later versions of the app by gamifying the experience and having users invest in the app experience. Stay Tuned! *Disclaimer: The views expressed in this article are based on personal observations of the author with respect to the ease of usage of mobile apps and the user interface deployed therein. These opinions do not necessarily reflect the views of SourceFuse Management. The information mentioned herein has been referred to only as a case study example for the purpose drawing comparison and highlighting the improvements/ enhancements that can be effected to offer an enhanced user experience. Opinions formulated by the author are for information purposes only and are made in good faith without any malice.